When I heard they were hosting a wine and food flight, I was curious beyond measure to see how they would pull it off. These affairs are usually intimate and conducive to meaningful conversation, new friendships and intimate moments. 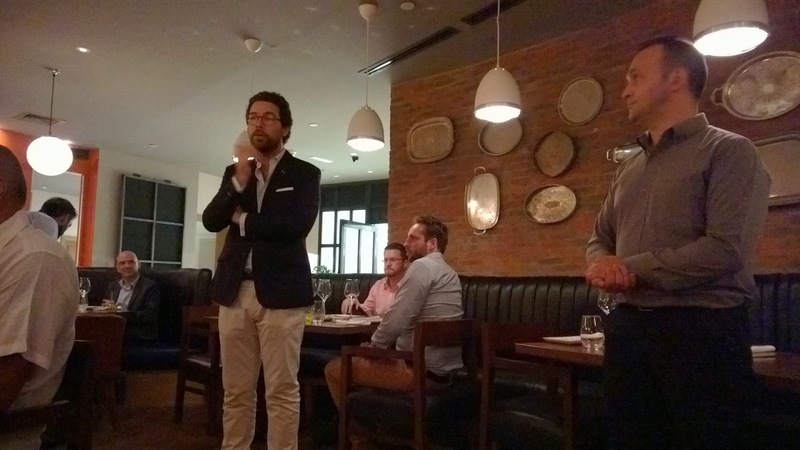 Edouard Payot (centre) introduces the wines. My immediate impression as I was shown to the flight area was that they had done it. In terms of finding a space that checked all the boxes with regards to intimacy, a place for meaningful conversation and intimate moments they had succeeded. They chose to use the elevated dining area at the opposite end of the bar which was a naturally closed off area and away from the rest of the restaurant, part still very much part of it if you will. Intimate yes. There may have been about 35 people there. Perfect. 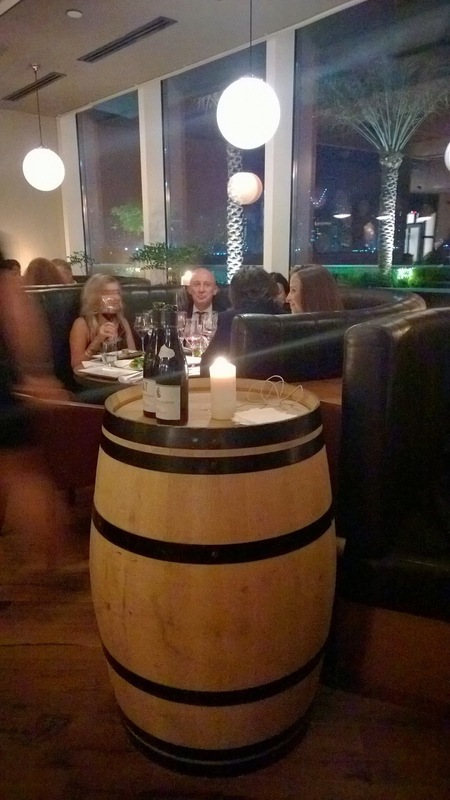 Wine barrels with large candles on them added that touch that made you feel it was an evening about wine. Two of the wines enjoyed. An evening about wine, yes. 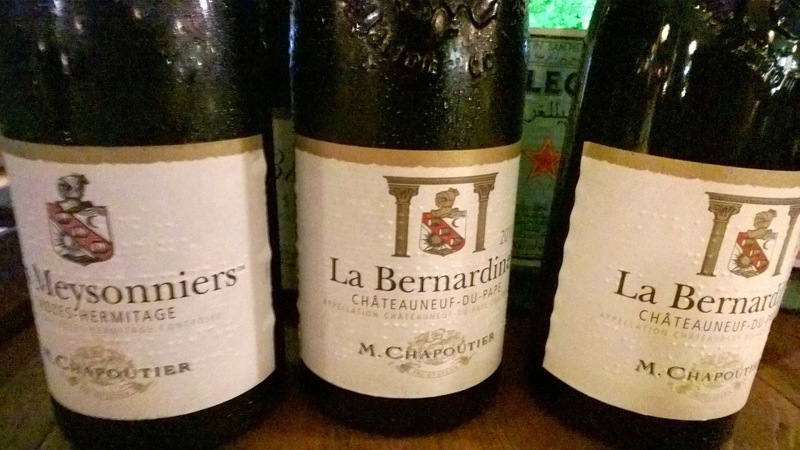 We were there to sample the wines of M. Chapoutier, a winemaker in the Rhone region of France with an emphasis on harmony with nature when it comes to the growth and harvesting of the grapes to the production and sale of wine. The evening starts off with some canapés and some of the wine that will be enjoyed on the night. While I arrived alone, it is not long before I am engaged in a conversation with one of the suppliers. The conversation moves effortlessly, and never do we engage in meaningless weather conversation. Family, London and Australia, wine in the UAE, great restaurants...that's the beauty of an evening like this. Regardless of the rest of the evening, Bentley has already created memories. After an hour or so, we take our seats and the restaurant manager welcomes everyone. He is too modest to even contemplate this, but it must be a proud moment for him. The wine dinner was born of something so elementary - a love for food, wine and people. Soon after we are given an introduction to the wine and the company philosophy by Edouard Payot, the export manager. We are fascinated - organic wine from the Rhone region. He is all about people enjoying wine. "You don't have to be a sommelier to enjoy wine", is one of the things he says that stays with me. A short but extremely useful talk that gives us a bit of context and insight into the wines to be enjoyed this night. 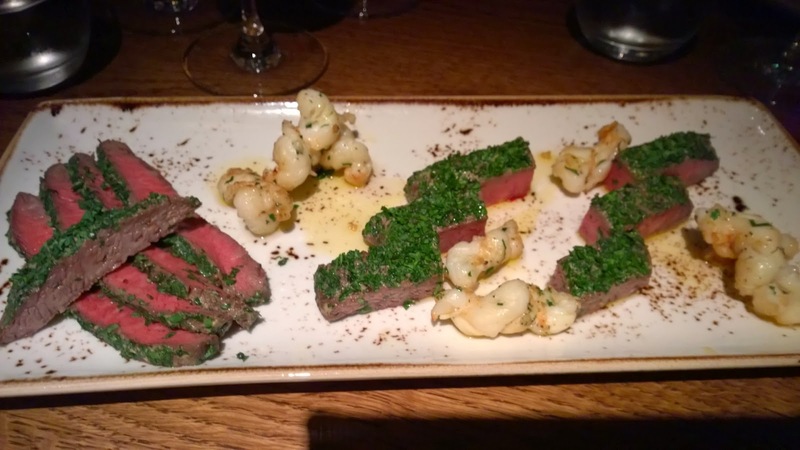 Mustard & Herb crusted Wagyu oyster blade, with garlic scampi. The wagyu is superbly cooked. The gorgeous pink colour in the pictures are a visual testament to that. The green of the herbs together with the colour of the wagyu create a bit of magic for the eye. Taste - so good! The tenderness that was hinted at by the pinkish colour is there to be enjoyed. The accompanying wine is a nice medium bodied one, with a bit of cherries on the tongue. Yum. Next up, is the New Zealand venison. 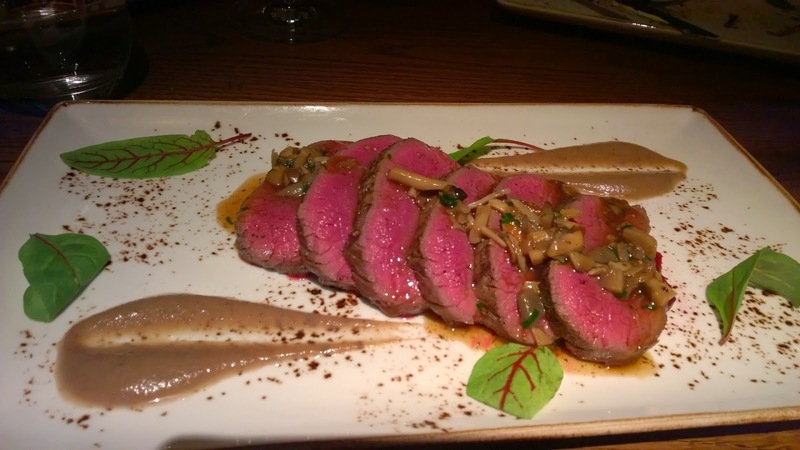 It is such a pleasure seeing venison on the menu. From my other posts you would have gathered that I more than appreciate a fine cut of beef. However, the venison has that edge of novelty to it. Again, Chef has served a fine piece of meat. The thing with venison is that it is can be quite chewy if cooked too long, but no such issues like that. 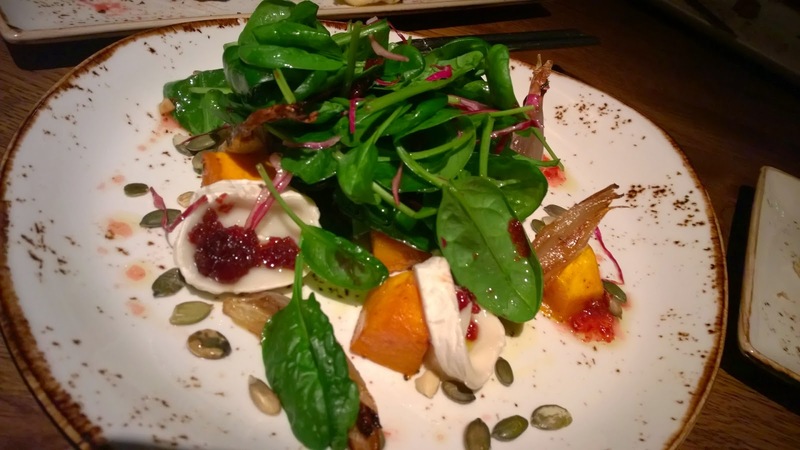 The added black currant puree and the bed of roasted beet root make this a dish that I would like to order again and again. 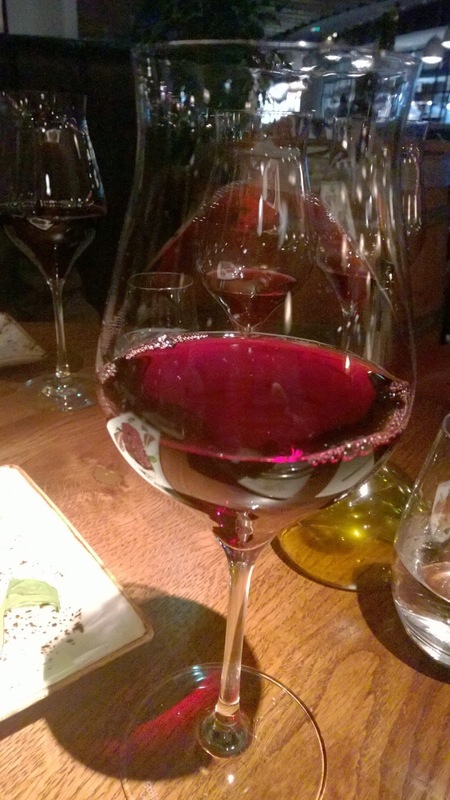 I enjoy it with another medium bodied wine, "Les Meysonniers", 2011, appellation Crozes-Hermitage. The peppery notes go well with the venison. The final dish is one of the dishes that one could call, notwithstanding it is till a young restaurant, a classic Bentley dish because it is so typical of a French bistro, the Beef bourguignon. We round it off with a wine that is more complex than its predecessors, has more intense colour and is also fuller. 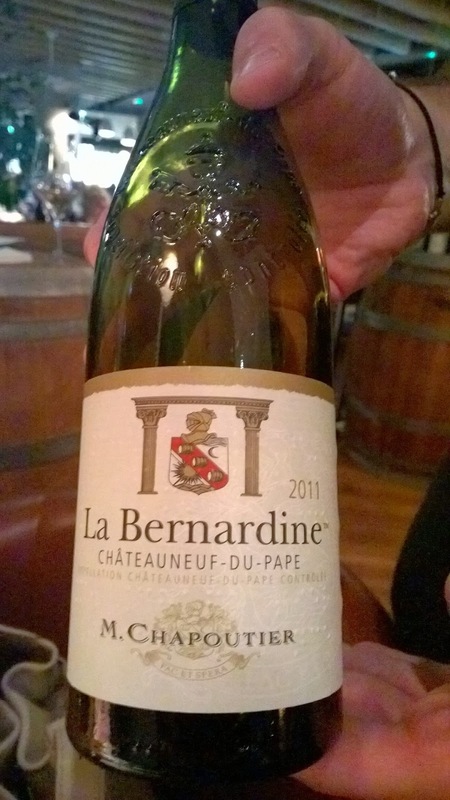 We are unanimous at our table that the "La Bernadine", 2011, appellation Chateauneuf du Pape is our favourite. 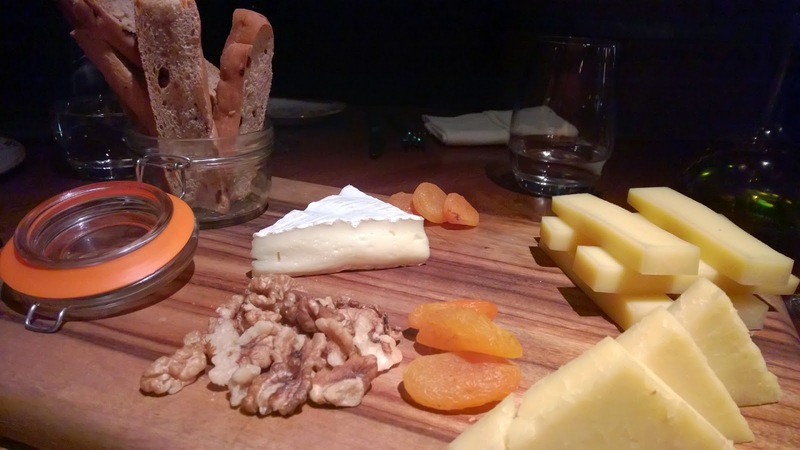 Dinner ends with a selection of cheeses, a fitting way to end a fabulous first wine dinner for Bentley Bistro & Bar. Bentley Bistro & Bar was able to take its large venue and create an intimate evening, where strangers could meet and talk about wine in a laidback environment. This wine dinner was not about which notes you could taste or what the strengths of each wine was. No, it was about enjoying wine with some excellent dishes. One of the suppliers summed up the philosophy of this night in words that were inspired by a visit to his home in Australia where he surprised his parents: "The best glass of wine is the one of which you want another." Restaurant Manager Argiris certainly succeeded in creating a space where people could relax and just enjoy another glass.